That’s what I’m calling the fiber that’s currently on my wheel. Technically, the colorway is recorded on the bag as “Harvest.” That works, too. But it’s really sparkly, so I’m going to to with my “Autumn Sparkles” anyway. At least in the comfort of my own home. It’s been really difficult to photograph in my basement (which is probably largely to do with the lighting and the abysmal choice of floor tile that the original owners put in decades ago), so better photos will probably have to wait until I get everything spun and plyed and I can rig up a better setting. I finished spinning and plying the first batch of wool on the wheel the other day. I had gone out to Uniquities to purchase a niddy-noddy a week or so ago and happened to pick up a back of purple merino while I was there. Don’t look at me like that. I know I said I wasn’t going to pick up any more fiber until I worked my way through the small stash I already had, but I had a reasoned argument for picking up the small bag. I was attached to the wool I already had – each color was beautiful and soft and I was imagining wonderful skeins of yarn streaming out of my drop spindle when I first got them. The trouble is, as fast as I am on the spindle, it’s just not fast enough. So the wheel was going to be the way to go, once I got one. But I didn’t want to take those beautiful pieces and mess them up with my first full, novice spinning attempts on the Traveller. I had already spun once, for a little while, on Casey’s wheel so, in theory, there shouldn’t have been much of a learning curve with the Traveller, but I knew that I was going to fumble my way through at least the first skein spun, from start to finish, on the wheel. So I didn’t want to ruin the fiber I already had (most of which had been a gift). Hence, the purchase of a small bag of beautiful purple Merino wool. Once I set the twist I’ll skein it and wrap it up for Christmas. I didn’t have a plan for the wool at the start, but I do now! It’s going to be a present for a woman I know who makes beautiful things – both knit and sewn. I’ve been the recipient of her work several times, and I want to make sure she gets something handmade in return this year. Note: The purple Merino has been set and skeined, and I am still in love with it. I found some pieces of bright tissue paper in the house and settled the skeins into a box for Mary. Now starts the waiting game. 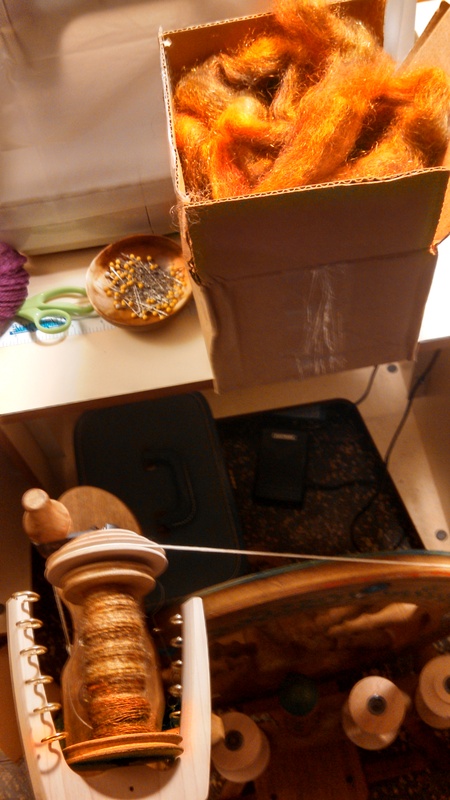 It took me three different evenings to spin and ply all the Harvest fiber. So much faster than my drop spindle! This colorway was so much fun to spin, watching the different colors shift into each other. There was a gold fiber that was positively luminescent, and a surprise pale green in the second half of the bag. Now I want to go back to Uniquities and see what other lovely colors they might have from Avalon Springs Farms.